Welcome to the March Cross Canada Blog Hop and our theme - languages. 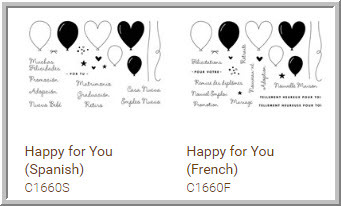 Close to my Heart has several stamps that are available in English, French, and Spanish, so we have decided to highlight them this month. If you are joining the hop from Kirsten's blog, you are in the right place, but if you want to start at the beginning, head to Michelle's blog where you will find the complete list of hoppers. As you hop through, please leave your comments as we love to hear what you think. I only have the English versions of the multi-language stamp sets, but I have included a pictures of the one I used so you can see what they look like. I decided to create a few 3" X 3" gift cards this month. One set is made using the Hello Lovely paper and New England Ivy as the base, and the other set uses the Sugar Rush paper with Pomegranate as the base. The stamp set is C1660 - Happy for You. I coloured the dovetailed banner with the Shimmer Brush Gold and layered it over a strip of our gold Glitter Trim using some Thin 3-D Foam Tape for a little dimension. On the card withe the Hello Lovely paper, the banner is coloured with the Shimmer Brush Clear. That's it for me this month. I am the last one on this month's hop, so if you would like to start over, please head back to Michelle's blog. If you have seen anything here that you would like more information about, please contact your local Close to my Heart consultant for more information.